Following the conclusion of recent trade discussions between China and the United States, leading negotiators from both countries have separately announced that the looming Sino-U.S. trade war is now “on hold,” and that both sides have reached a consensus on trade. The White House also released a joint statement on the Washington trade talks on May 19. The joint statement, public remarks by Trump administration officials, and other recent official comments in China affirm our earlier analysis of good progress being made at the first round of Sino-U.S. trade talks in Beijing. May 15: State Council vice premier Liu He, a special envoy of Xi Jinping, leads a Chinese trade delegation to Washington to follow on trade talks in Beijing on May 3 and May 4. May 17: A U.S. trade delegation including Treasury Secretary Steven Mnuchin, Commerce Secretary Wilbur Ross, and United States Trade Representative Robert Lighthizer formally held two days of trade talks with Liu He and the Chinese delegation. 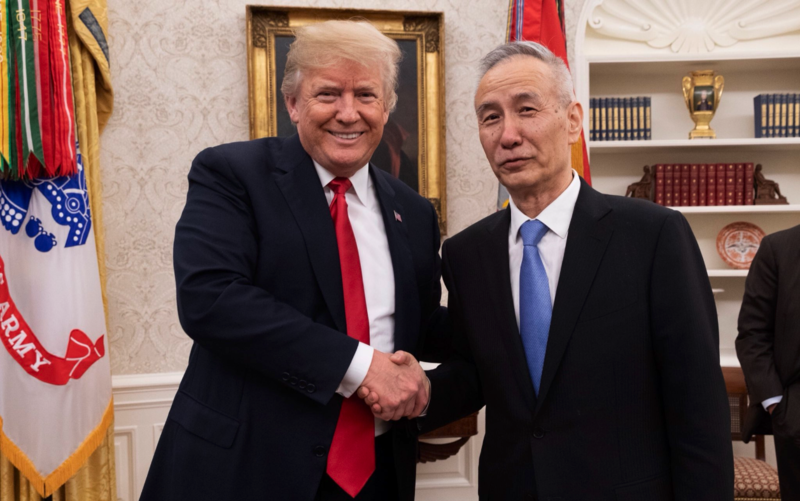 President Donald Trump also met with Liu in the Oval Office on May 17, and heard Liu’s presentation on China reducing tariffs and other measures. Before meeting Liu He, Trump downplayed the success of trade talks in answering questions by reporters. He also suggested that North Korea’s “about face” could have something to do with Kim Jong Un having a second meeting with Xi Jinping in Dalian recently. May 18: Several leading U.S. newspapers reported on May 18 that China had agreed to offer a $200 billion package to cut the U.S. trade deficit. White House economic advisor Larry Kudlow made similar remarks. Chinese state newspaper denied that such a specific deal had been reached. China, however, dropped an anti-dumping probe into imported U.S. sorghum. Meanwhile, the People’s Bank of China announced that overseas renminbi clearing banks can conduct more business such as interbank borrowing and cross-border account financing. May 19: China and the U.S. release a joint statement on the “constructive consultations on trade” in Washington. The statement noted a “consensus” on both countries taking effective measures to substantially reduce the U.S. trade gap with China. Both sides also agreed on “meaningful increases in United States agriculture and energy exports,” and that a U.S. team would head to China to work on the details. Also discussed were issues of intellectual property protection, expanding trade in manufactured products and services, and the need to create a level playing field for trade. Meanwhile, at a Beijing forum themed “Financial Reform, Opening-up and Stability in the New Era,” Zhu Min, the head of Tsinghua University’s National Institute of Financial Research, said that the core of opening up China’s markets is to create an international financial market that is in line with international standards. He added that China’s current degree of “internationalization” is severely lagging behind the ideal and is ill-suited to the country’s current situation. The state-owned Securities Times reported that visa-free access to Hainan would be extended to tourists from all countries with diplomatic relations with China. Currently, tourists from 59 countries (including the U.S.) can stay in Hainan without a visa for up to 30 days. Also, Chinese netizens discovered that they were able to search for and access the websites of previously blocked English-language news outlets like The Financial Times, The Wall Street Journal, and CNN. The netizens posted screen captures on Chinese social media, and some credited and thanked Trump for the apparent uncensoring of news sites. SinoInsider has not been able to independently verify this development. May 20: According to Xinhua, Liu He said that the “biggest results” of the trade talks was that both sides had reached a consensus, “vowed not to launch a trade war against each other,” and would cease to impose tariffs. Meanwhile, the Global Times and the Communist Youth League Weibo account published material expressing the stance that China should not sign an “unequal treaty” with America. Speaking to CBS, Kudlow said that both sides are “not at the detail point” of the $200 billion cut, “but our view is China must open up.” On ABC’s “This Week” program, Kudlow said that China is “offering to make structural reforms, such as lower tariffs and lowering nontariff barriers, which will permit us to export billions and billions more goods” to the country. In a statement, U.S. Trade Representative Robert Lighthizer said that Washington may still impose tariffs on China unless it makes “real structural change” to its economy. 1. Some observers believe that the vagueness of the joint statement on Sino-U.S. trade talks in Washington indicate that little or no progress has been made. On the contrary, we believe that the vagueness is deliberate precisely because good progress benefiting the U.S. has been made. We previously wrote that America has to show Xi Jinping face to consolidate any gains from the trade negotiations. China, like North Korea, is run by a communist regime. Communist regimes are especially image-conscious, and cannot show any weakness or admit to concessions in state propaganda even if they have indeed given up significant ground. Vague statements from the U.S. help the Xi administration to spin concessions in a positive light and denies Xi’s rivals an excuse to undermine his rule. And the Trump administration needs Xi to be unchallenged domestically to ensure that Beijing can push through structural changes to China’s economy and open up the mainland markets. Naysayers of positive progress in Sino-U.S. trade negotiations may wish to consider that both sides have publicly acknowledged a consensus, have agreed to suspend tariffs, and are scheduling future talks to work out the details of U.S. agriculture and energy exports. If hardly any progress was made, there would be no need for further talks and the world would see an escalating trade war. 2. While details of the supposed $200 billion package to reduce the U.S. trade deficit with China are unclear, remarks by Trump administration officials and developments in China suggest that China would indeed open up its markets to a greater degree. Official rhetoric is already in favor of opening up, and the quiet uncensoring of English language news sites, if not a fluke, is another sign. Xi Jinping, however, should face domestic opposition to opening up. The references to “unequal treaties” in the Global Times and China Youth Daily are examples of internal resistance. 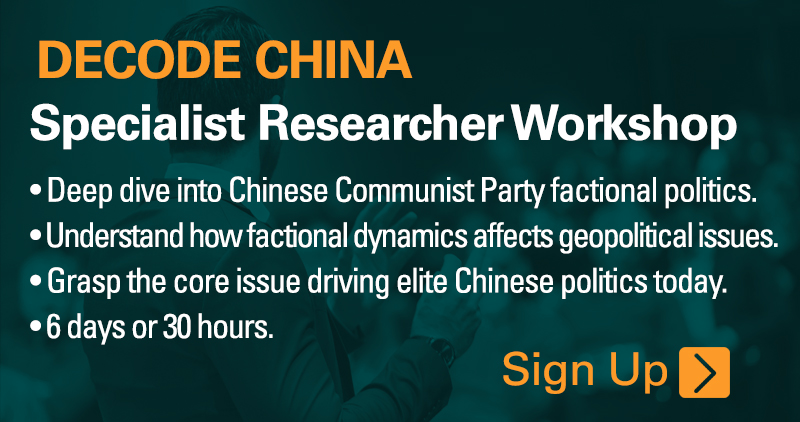 Both publications have connections to Xi’s political rivals, and are known to carry odd messaging that oppose Xi’s policies from time to time. 3. China and the U.S. could hold several rounds of talks to nail down the details of the trade negotiations. China may only be able to cut the trade deficit by $200 billion after opening up its markets and bringing its economy closer to what it was supposed to be after joining the World Trade Organization. 4. One result of China importing more from the U.S. is its weakened influence abroad. China would import substantially lesser from Belt and Road countries, especially energy imports from Russia, Iran and other Middle East countries. The U.S. dollar should also strengthen with increased exports to China. 1. With the macro trade issues between China and the U.S. essentially settled, both countries should focus their attention next on reining in North Korea. Treasury secretary Mnuchin said in his May 20 Fox News interview that he has a commitment from Liu He that China would continue to enforce sanctions on North Korea and that China, like the U.S., also wants Pyongyang to dispose of its nuclear weapons. 2. We wrote earlier that North Korea likely sought to gain leverage on China by doing an “about face” during the Sino-U.S. trade talks. With the talks concluded, North Korea could quietly revert to a more agreeable tone. Xi Jinping could even see that Kim Jong Un behaves by tightening sanctions. 3. While the Trump administration cannot rescind the ZTE ban following an amendment by the House Appropriations Committee to uphold the sanctions, the Commerce Department could find a way to give ZTE some form of reprieve yet keep it on a tight lease. Throwing ZTE a lifeline now would allow the U.S. to continually extract concessions from China and get its help in reining in Huawei or with sanctioning Iran. Should ZTE collapse soon, however, America would be denied a long-term strategic option to deal with China.